Majuda CallTracker is not only a VoIP recording solution but a solution that can record calls whether they are on analog, digital or VoIP platforms. This solution is designed to be completely customizable, scalable and most importantly, reliable, in order to meet the current and future needs of any organization. 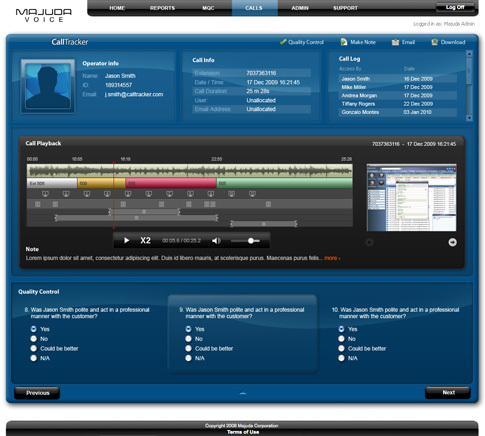 Majuda CallTracker is at the heart of the Majuda Voice Suite and caters for full time, partial and random voice logging for liability, compliance and/or quality management requirements. The Majuda CallTracker is everything you need. Enjoy VoIP recording for all digital, analog and VoIP platforms, an intuitive interface, an outstanding search functionality and air-tight security.